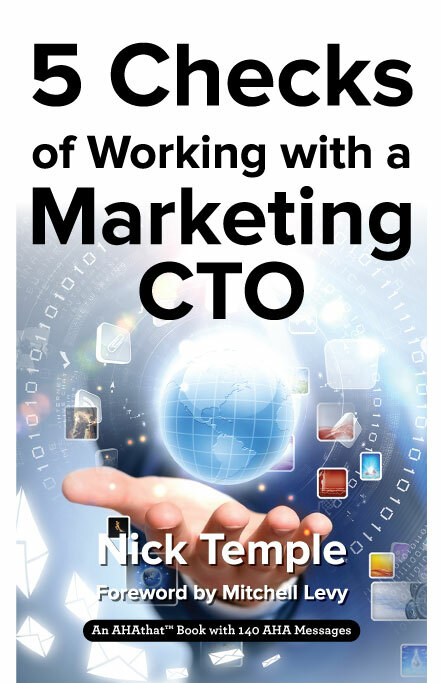 With Nick Temple's "5 Checks of Working With a Marketing CTO"
CUPERTINO, CA (PR Buzz) – February 19, 2019 – – Great ideas are good for business. Thinking out of the box and being able to offer consumers something they never thought they’d need is an innovation that will bring success to business-minded individuals. However, there are moments when ideas become too overwhelming and are eventually mishandled. This often happens when there is a lack of planning and consistency in monitoring a project's progress. Nick Temple, a tech-savvy and successful marketer, made use of his knowledge in software engineering and experience in entrepreneurship to devise a formula that will aid every business in successfully deploying ideas and letting them grow into tangible income. Regardless of what industry you’re in, these five intertwined checkpoints — sanity check, resource check, technology check, marketplace check, and partner check —will surely get the business going on the tough road of marketing competition. This book is composed of 140 AHAmessages™ that reveal the importance of having a streamlined process of managing a bank of ideas. They provide methods to succeed in conceptualizing, developing, and deploying ideas to convert them into products or services with guaranteed market value to consumers. A hardcover, paperback, and Kindle versions of this book are available on Amazon. You can download the Kindle version of this book for FREE until February 23! Grab your copy now: https://amzn.to/2MT0g1X. "Nick Temple is a genius in turning ideas into real business income. His book, "5 Checks of Working With a Marketing CTO" can truly guide a company to success by teaching themto do things right the first time,"says Mitchell Levy (http://aha.pub/MitchellLevy), Global Credibility Expert and The AHA Guy at AHAthat® (https://AHAthat.com). Read and share AHAmessages in this AHAbook on Twitter, LinkedIn, and Facebook by going to http://aha.pub/5Checks.